In 1943 in Great Britain, when hope and the moral fabric of society were being threatened by the relentless inhumanity of global war, an Oxford don – C.S. Lewis was invited to give a series of radio lectures addressing the central issues of Christianity. Over half a century after the original lectures, the topic retains it urgency. Expanded into book form, Mere Christianity set out to provide a rational basis for Christianity in an era of modernity. Fast forward to the 21st century. We now live in a post-modern era in the western world. When Lewis wrote in 1943 lines of black and white, right and wrong were very clear, not so anymore. How can we believe in a personal God in an age of skepticism unlike the times of fifty years ago? Are there any cogent reasons to believe in God in an age of relativistic thought? Enter Tim Keller. 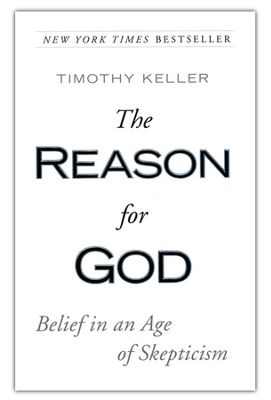 Tim Keller’s Reason for God has provided for modern Christians and skeptics what C.S. Lewis provided in his time – a reasoned defense over the main objections to Christianity: (1) There can’t be just one true religion; (2) How could a good God allow suffering? (3) Christianity is a straightjacket; (4) The Church is Responsible for So Much Injustice; (5) How can a loving God send people to Hell? (6) Science has disproved Christianity; (7) You can’t take the Bible literally…and then in provided seven offensive cases for the coherency of rational Christianity: (1) The clues of God; (2) The knowledge of God; (3) The problem of sin; (4) Religion and the Gospel; (5) The true story of the cross; (6) The reality of the resurrection; (7) The dance of God. In reading the book one finds a step by step macro level picture of why a reasonable belief in God is rational and compelling in a postmodern world. All other world-views leave one full of loopholes and contradictions. Only Christianity gives one the comprehensive lenses by which we can see ourselves, the world, and a personal God more clearly and logically. Life, relationships, and our place in the universe has meaning, purpose, and hope if there is indeed the existence of a Holy God who came and died for us to know Him and to make Him known. I highly recommend this book for both skeptics of Christianity and believers in Christianity. It will answer the most important questions we can ever ask about faith, life, the after life, and the most important issues of our day. Tim Keller answers the profoundest questions we have with humility, sensitivity, biblically, and practically. It is one of the “must reading” books for our times. I especially would like to see Christians giving this book to their unbelieving friends and reading the book with them. It is a great book for discussion and building bridges to the gospel – and thus opening the door for a relationship with God through His Son – Jesus Christ. The list of seven “objections” is missing #4.